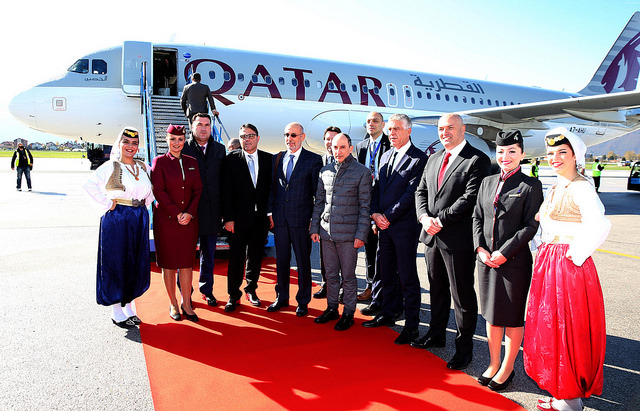 The first Qatar Airways non-stop flight from Doha to Sarajevo touched down today at Sarajevo International Airport, where it was greeted with a traditional water cannon salute. The newly-launched service to the capital of Bosnia and Herzegovina will operate a four-times-weekly schedule on Sunday, Tuesday, Wednesday and Friday, with a flight time of just six hours. Qatar Airways Group Chief Executive, His Excellency Akbar Al Baker, travelled on board the inaugural flight with the Bosnian and Herzegovinian Ambassador to the State of Qatar, His Excellency Tarik Sadović, whose support has led to the launch of the scheduled service, and was greeted by Qatar’s Ambassador to Bosnia and Herzegovina, His Excellency Rashid bin Mubarak Al Kuwari; Armin Kajmaković, Director Sarajevo International Airport and Mayor of Sarajevo, Abdulah Skaka. The Ambassador of Bosnia and Herzegovina to Qatar, H.E. 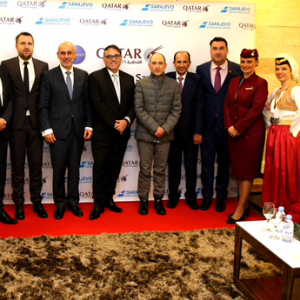 Mr Tarik Sadović, said: "Following the launch of the Doha to Sarajevo direct flight service, we open a new chapter in relations between two friendly countries: Qatar and Bosnia and Herzegovina. This will greatly facilitate our cooperation and initiate development in various areas. We thank the Emir of the State of Qatar, His Highness Sheikh Tamim bin Hamad Al Thani, for his wise leadership and support. We especially thank and congratulate Qatar Airways Group Chief Executive H.E. Mr Akbar Al Baker and his associates for bringing the world's best airline to Sarajevo. “We welcome their readiness to promote Bosnia and Herzegovina in Qatar and beyond in key global markets. We congratulate all the domestic decision makers on a job well-done. We are pleased to point out that the Embassy of Bosnia and Herzegovina in Doha has in its capacity successfully completed this diplomatic task and was a reliable partner during the entire process." In the last four months, Qatar Airways has bolstered its already robust operations in Eastern Europe by expanding its network to include Skopje, Prague, and Kyiv. The airline has served key cities in the region such as Belgrade, Warsaw and Zagreb for many years, and sees the potential for continued growth in this rapidly developing market. Qatar Airways will operate four times a week to Sarajevo with an Airbus A320 aircraft, which features 12 seats in Business Class and 132 seats in Economy Class. Passengers will be able to enjoy the airline’s superior entertainment system offering countless entertainment options. Sarajevo, a sophisticated city, captivates tourists with its intriguing juxtaposition of past and present. Visitors can wander through Baščaršija, Sarajevo's bazaar built during the Ottoman period, or visit the Yellow Fortress, which offers a spectacular view of the city. In winter, Sarajevo's mountain resorts Bjelašnica and Jahorina offer some of Europe's best-value skiing. Qatar Airways Cargo will commence belly service to Sarajevo, supporting local trade growth in the export of agricultural and food products, furniture, garments, textiles and automotive parts, as well as the import of consumer goods and electricals. Qatar Airways will be adding flights to many more exciting destinations to its network in 2017 and 2018, including Canberra, Australia; Chiang Mai, Thailand; and Cardiff, UK, to name a few.